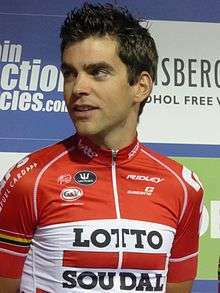 Tony Gallopin (born 24 May 1988) is a French professional road racing cyclist, who currently rides for UCI ProTeam Lotto–Soudal. Born in Dourdan, Île-de-France, Gallopin currently resides in Angerville. After two seasons with the RadioShack–Leopard squad, Gallopin joined the Lotto–Belisol team for the 2014 season. On 13 July 2014 Gallopin escaped in a breakaway on Stage 9 of the Tour de France, gaining almost 8 minutes on the leader Vincenzo Nibali to take the yellow jersey. 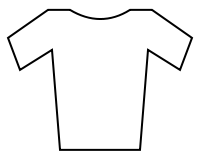 Three days later, on Stage 11, Gallopin escaped from the main peloton on the final descent into Oyonnax to win the stage, just in front of the chasing pack. Gallopin married fellow racing cyclist and former French national road racing champion Marion Rousse on 18 October 2014. WD = Withdrew; IP = In progress. 1 2 "Tony Gallopin signs for Lotto Belisol". Cyclingnews.com. Future plc. 6 August 2013. Retrieved 6 August 2013. 1 2 "Tony Gallopin". Radioshack-Leopard-Trek. Leopard S.A. 5 December 2011. Retrieved 17 January 2012. ↑ "Bienvenue amis cyclards, ici news, photos et résultats de Tony Gallopin !! !". Tony Gallopin. 5 December 2011. Retrieved 17 January 2012. ↑ "Gallopin et Rousse se sont mariés". L'Equipe. 18 October 2014. ↑ "Palmares de Tony Gallopin". Cyclingbase.com. 5 December 2011. Retrieved 17 January 2012. Wikimedia Commons has media related to Tony Gallopin.